Life in colonial America was not easy. Those first settlers had to endure very harsh conditions. In the eastern States, which was settled first, those rugged individuals had to deal with very cold winter months, and hot, humid summers. Add to those conditions wild animals, and disease, and you get an idea of how difficult that life style was. Often, I have searched for the old home sites of those first settlers. I am talking about the old settlements, now ghost towns, of our pioneers that once existed in the eastern states. To help me in my searches for the old settlements, I have used my skills as a treasure hunter, and a history lover. The research skills I’ve obtained from those two endeavors have helped me find the ghost towns. When standing on the site of the old towns in the east, I am always amazed, and feel a sense of awe and appreciation for how those first settlers had lived. If you love American history, as I do, you to can search for and find one of these old ghost towns. It’s not hard to do. Just as exciting as locating one of the old towns in the east, is finding a relic that has been lying on the ground, or below it, if you own a metal detector. If you are a beginner in the metal detecting hobby, or you are a veteran treasure hunter, locating the old home sites is an exciting adventure. 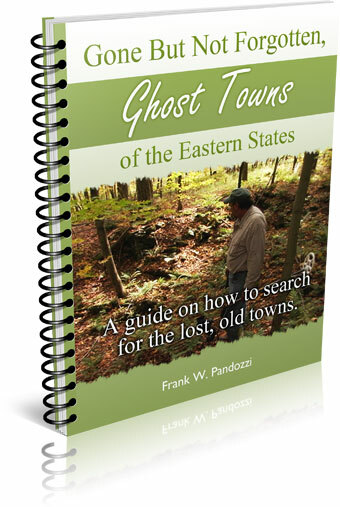 Throughout this website, I will share with you the information that will allow you to search for the old ghost towns of the east, and how to search around them by using a metal detector. It was the time after the French and Indian War and the War of 1812 when most of the settlers began to literally dig out an existence for themselves in what was a very demanding and brutal land. Creating a life in colonial America at that time was a new experience for most of our first pioneers. Not only did those hardy folks have to clear their lands by hand, build their homes, and make sure they had enough food, but they also had to create that life without electricity, or running water. If you live in the east, you may not know that you drive right by eastern ghost towns and cellar holes many times. Everything they did was done by hand, including digging the cellars for the homes. After digging the cellar, the foundations had to be laid. This meant clearing the area of rocks and then carrying them to the cellar where they would be laid on top of each other. While the homes were being built, the land had to be cleared for farming. Gardens had to be planted so that food was available, especially for the long hard winter months. And their only transportation was by wooden wagons pulled by horses, mules or oxen. Many of the old roads leading to the ghost towns in the east are difficult to navigate with a 4-wheel drive vehicle. Imagine how hard it was two hundred years ago for Americas first settlers in the east to travel by wagon? Raising a family was a difficult life in colonial America. Many young babies and children died from disease. Many times I see an old tombstone on those home sites…often the grave is the burial site of a young child. I have much respect for those pioneers. Life in colonial America was a constant struggle for survival. Most of the information that you will be reading about throughout this website is based on my popular TV series “Ghost Towns Of The East”. View the "Synopsis Show Intro" first...Then come on back. Ghost towns in the east are nothing more than a hole in the ground…these holes are cellar holes. The empty cellar holes are what’s left of the houses that once sat on top of them. Those areas are where the first settlers carved out their life in America. Searching for cellar holes, or ghost towns is an exciting adventure that can lead to some interesting experiences and treasures. Many times, in the areas surrounding the ghost towns, I find pieces of history lying on the ground, relics untouched for hundreds of years. Old bottles, and bits of pottery often lay scattered on the ground. The bottles, pottery and relics give you an idea of the everyday life in colonial America. Many times you can hike, or backpack into remote areas, or just drive the back country roads in search for these eastern ghost towns. 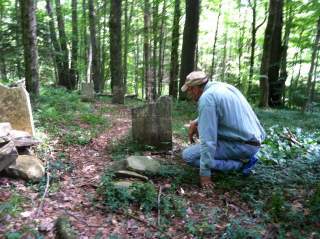 Searching for and metal detecting ghost towns in the east can involve your entire family. IMPORTANT…If you are going to search for ghost towns on state lands you must pay attention to the laws that govern removing artifacts or relics from state owned property. The information I have put into this website is the same information that I use in guiding our viewers to the eastern ghost towns in my TV series. For those of you who will never be able to travel out West to visit a ghost town, but would like to try searching for the old settlements in the east, this information will help you. 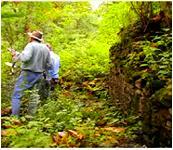 And of course, using a metal detector to locate relics will give you a better understanding of life in colonial America. If you are interested in purchasing a metal detector, or you need metal detecting accessories, please visit my online store. Learn where the lost towns of the east are located, and how to find them. 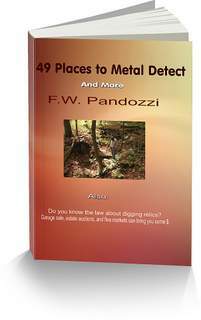 If you metal detect, learn the best way to search around the old cellar holes for best results. Those pioneers that forged a life in colonial America left behind many signs and relics of their existence. Here is more information about this report.